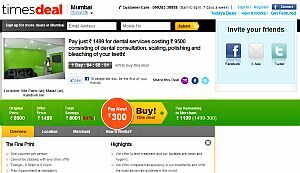 Shortly after Rediff.com launched its daily deals sub-site DealHoJaaye, Times Internet (Indiatimes) has launched TimesDeal.com. Times Internet is the digital arm of media group BCCL, which publishes the daily Times of India and financial paper The Economic Times. The website currently offers deals in six cities - Bangalore, Mumbai, New Delhi-NCR, Pune, Kolkata and Chennai. It will be providing deals in various categories including products, travel as well as restaurants and other services. Recently, Times Internet extended its mobile deals and discounts service Active Deals to 25 Indian cities, offering deals on wine & dine (hotels/restaurants), fast food, health & beauty, entertainment, home needs, electronics, apparels and accessories as well as books to mobile users. Here is a recap of all the e-commerce sites in the daily deals segment in India - Groupon India, eBay India, Snapdeal.com, Dealsandyou.com, Mydala.com, Koovs.com, Dailydeal.in, Dealivore.com, Khojguru.com, Thekha.com, Scoopstr.com, 24Hoursloot.com, Masthideals.com, Snatchdeals.com, Lootmore.com, 30Sunday.com and Bindasbargain.com.